Most of our solutions process information and send the resulting data into the various systems of record. In that experience, there has always been information that needs a home but the systems of record make it too complex or too expensive to implement for that need. Data ends up being managed in Excel spreadsheets, Access databases, Lotus Notes databases or some older application that is no longer leading-edge technology. This can all be moved to a data management platform that has integrated workflow, document capture and content management. In typical Hyland fashion, all of this is provided in a point and click configurable tool. With OnBase WorkView, you can manage data and provide a user-friendly interface to add, modify or update any transaction or any record. OnBase WorkView can create any data model utilizing relational tables with many to one relationships. A good example of this is vendor management. Vendor records can have parent-child relationships with objects like contracts, products, incidents, notes, tasks and contracts. Because the WorkView tool allows you to create any type of data model with relationships to other data models, there is no limitation to the type of data objects that can be related to vendors. These parent and child objects can stand on their own, be searched for and actioned on together or on their own. Your application’s name is displayed in the Ribbon and over the Filters panel on the left. Select a Filter to search data and results are displayed on the right. All the features to work with your data are easily accessed on the Filter Ribbon. With OnBase WorkView, your information management needs are complete. Capture, store, retrieve, manage and automate all the documents and data coming into or being generated by your organization. All this using one of the most point and click configurable tools available in the industry. 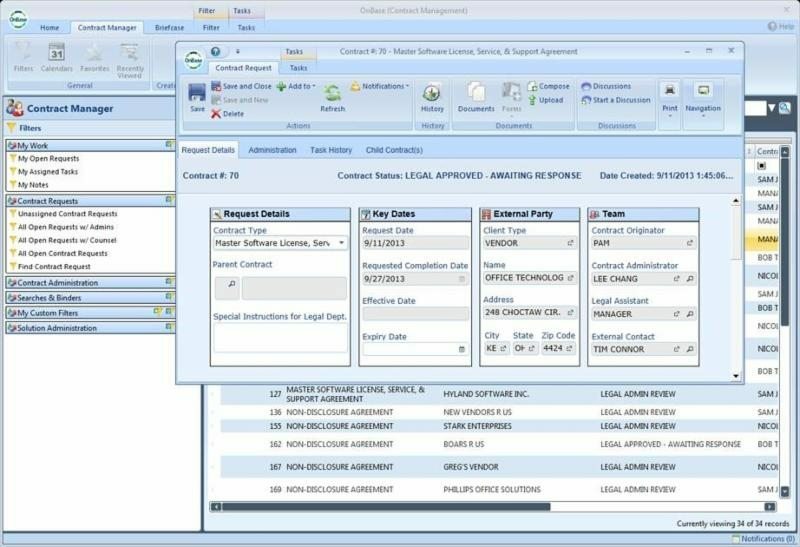 For more information about OnBase WorkView, click here, email us at sales@allstarss.com or contact your existing Solutions Management expert at All Star Software Systems.